Hi check out the sale of my schoolsky Apple-1 computer - part of the proceeds will help fund "The Foundation for Amateur International Radio Service" (FAIRS) and N4USA. Chantilly Farm and Campground in Floyd, Virginia just a few minutes from the Blue Ridge Parkway (MP150). Ham Radio operators are encouraged to operate at the campground. My blog readers know me as a historical microcomputer collector/historian and developer of the Bugbook Historical Computer Museum collection. I also own this beautiful 200 acre Chantilly Farm in Floyd County, Virginia and operate N4USA. Chantilly Campground is Ham friendly with Amateur Radio Station N4USA in our Campground office. You can hook up to existing antenna in campground and there are many locations with trees or other structures making it very easy to put up an antenna at a good height most anywhere on our 200 acres. WiFi is available from most locations on the farm. It is a delight to operate from Chantilly Farm using your own call or N4USA. David KK4WW Curator of N4USA and owner of Chantilly Campground has been a ham operator for 63 years and makes this comment "this is the best radio location I have ever operated from". We are in Floyd County, Virginia the Heart of the Blue Ridge Mountains. Ham operators love our 2500 foot mountain top location for making DX contacts. VHF/UHF operators have incredable signals up and down the East Coast. Our camping guest can chose full service with water, 30/50 amp power & septic, RV camping or tent camping on our 200 acres. Some primitive tent locations have AC power. We are open all year "Weather permitting"
Camping in RV spaces 16, 17, 18 or 19 you can hook your radio up to an existing G5RV antenna and incredible HF signal from our mountian top location. Campground is open all year weather permitting - call (540-808-4984) to check conditions in the winter. See photos lower in this blog post. Check out our camping facilities here "CLICK"
Memorial Day Weekend at Chantilly. Floyd County, VA has many other interesting events and activities that the whole family can enjoy. The area is known for its many musicians and artist. Every week there are numerous music events within the county. A number of art galleries and studios are open 12 months of the year. Other activities include hiking, Blue Ridge Parkway is the 42 mile Eastern boundary and the Virginias Crooked Road Music trail goes through the heart of Floyd County. Riverstone Organic farm is less the 2 miles from our campground. You may want to visit Chantilly Farm during ar festival weekend with music or other events at our farm. Check out this list of activities in the Floyd area visit Floyd Virginia . 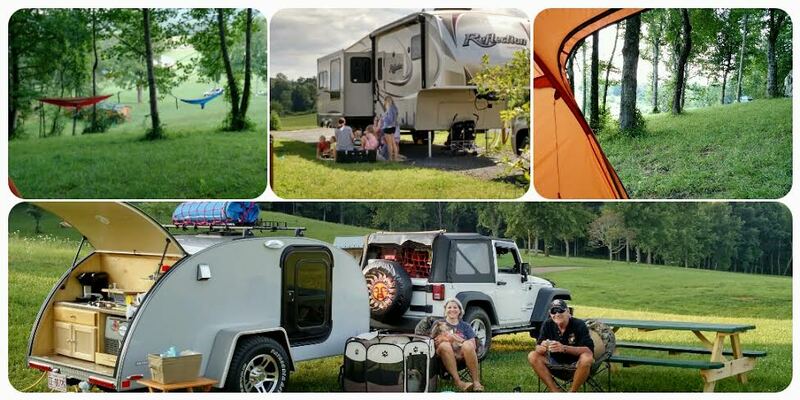 Here are a few more incredible activities your family may enjoy at Chantilly Campground. 1. Dark Sky ! If you like to look at the night sky we have a very dark sky. We are out in the country with a few near by farms. When the lights at Chantilly are on the dark sky view is great, however we can turn off the outdoor lights at the farm for you by request. We are not an official Dark Sky location, however the view is incredible from our mountain top location of 2500 feet in the heart of the Blue Ridge Mountains. Some visitors have said "This as good as it gets anywhere". 2. Forest Bathing ! We have many acres of forest available for the relexing and healing or just enjoy the solitude and wonders of nature. Our forest is mostly a mix of Eastern hardwoods with a few pine trees mixed in. There must be at least 20 varities of hardwoods and many varities of wild mushrooms. You can just hike the trails or go into the wild natural forest. Science has proven the benifit of Forest Bathing and it is also refered to as Forest Therapy. Take a look at the science here "CLICK" . 3. Outdoor recreation! Large open grassy fields (view here "click") are just waiting for you to take advantage of outdoor sports activities. We have small disk golf area ready to play. Bring your own outdoor games and enjoy the huge open fields. 4. Blue Water kayaking or rafting! The Little River is only 13 miles from the campground. You can rent a kayak from us or better yet, contact On The Water for full service river activities (great photos of river actiities on this web site). Take your QRP rig and operate Maritime Mobile from your canoe or kayak. We also had OQS with W4UDC Tom however the conditions deteriorated. 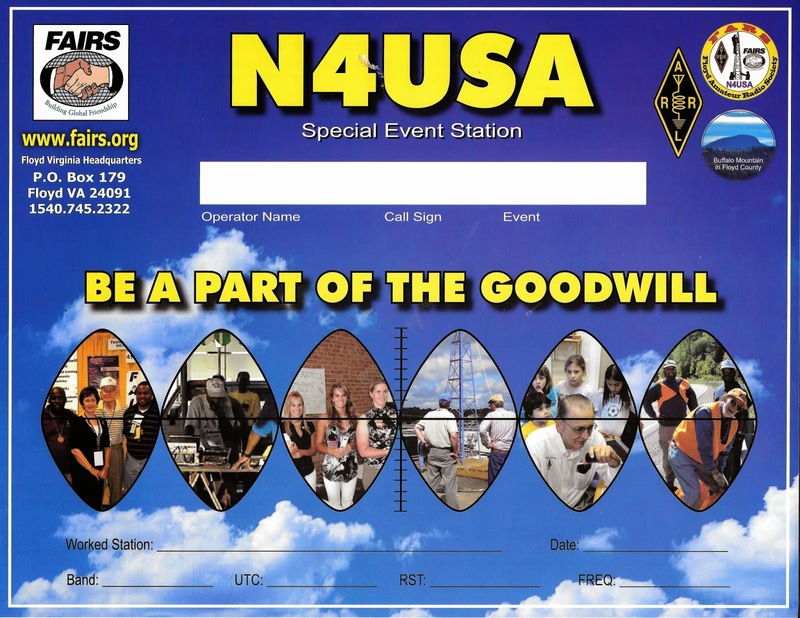 Check out these videos of Chantilly Farm - a view from the sky by drone "CLICK" and a view from the ground "CLICK"
Amateur Radio station N4USA is part of the "Foundation for Amateur International Radio Service" (FAIRS) -- a non profit foundation with the mission statement of "International Good Will Through Amateur Radio" . The LCF Group has been directing the activities for FAIRS for 24 years with projects in many countries. The "LCF Group" consist of myself David Larsen KK4WW, Gaynell Larsen KK4WWW & Dee Wallace KG4VMI. 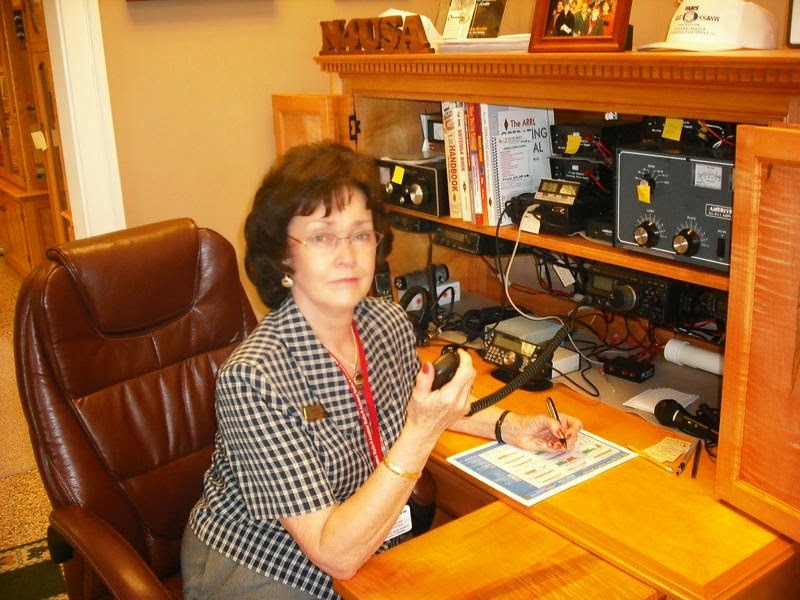 Here is Gaynell Larsen KK4WWW operating as N4USA. David Larsen KK4WW, and Dee Wallace KG4VMI are owner operators of Chantilly Campground and welcome visiting hams to operate the station at our campground office as N4USA. Visitors are welcome to set up their own station here at Chantilly and operate with their own call as well. 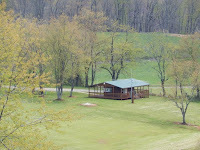 N4USA amateur radio station is located about 6 miles from the the town of Floyd VA at Chantilly Farm. The operation from the farm is excellent with no industrial noise and on a mountain ridge at 2600 feet in the heart of the Blue Ridge Mountains. Here is Clement Pierre Luis our friend from Dominica operating N4USA. The beam antenna at N4USA Chantilly is on a 35 foot crank up tower and works very good. A G5RV is used for other hf bands and several UHF/VHF antennas & transceivers are part of the station. We have many tall trees making it easy to put up wire antennas for field day or camping style operation. Here is an Ariel video of our 200 acres. That is Dave KK4WW cranking up the beam. 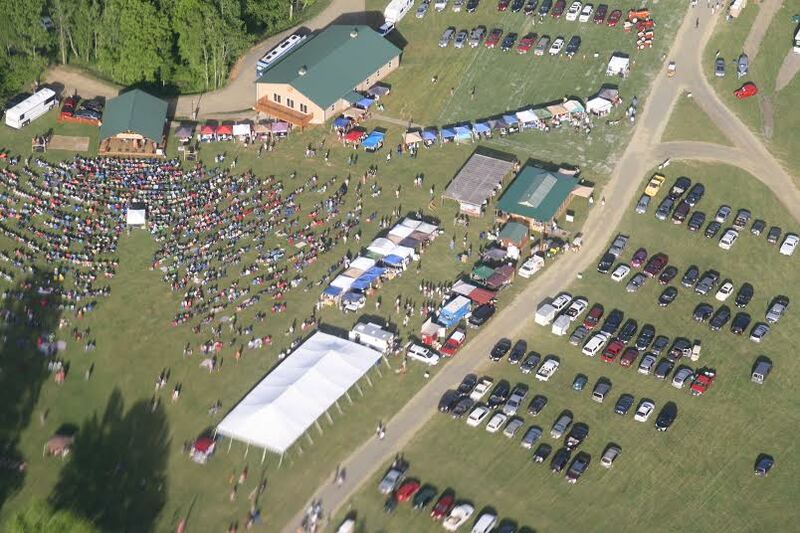 Check out these videos of Chantilly Farm - a view from the Drone "CLICK" and a view from the ground "CLICK"
This is our large 8 x 11 QSL card for confirming contact during special events. The back of QSL enlarge to read about our the FAIRS foundation was started in 1992. 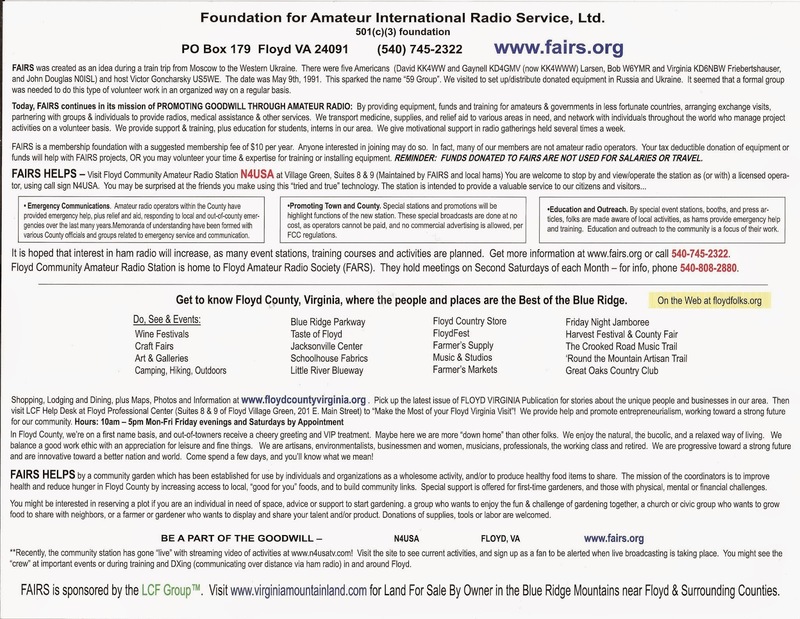 FAIRS was formed as an Amateur Radio nonprofit in 1992 after a trip to the Soviet Union in October of 1990. The 11 FAIRS founders realized that a group of amateur radio hams had no recognition or ability to function at high government levels & applied for the nonprofit charter. 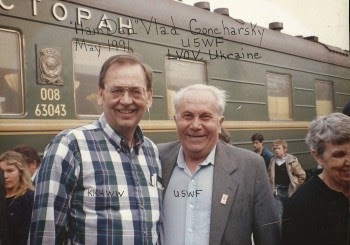 Dave KK4WW shown here with Vlad Goncharsky (RT) U5WF. Vald was FAIRS member #3 and a very good friend until his death several years ago. FAIRS members made about 20 visits to the former Soviet Country Ukraine from 1990 to 2007. Amateur radio projects are still on going by FAIRS in Ukraine by Victor Goncharsky US5WE. A few samples of N4USA FAIRS projects at home and International. Cub Scouts & Boy Scouts operating Scout Jamboree on the Air from N4USA at Chantilly. The local Floyd Amateur Radio Society W4FCV and the Amateur Radio Club from Virginia Tech K4KDJ assisted this 2014 JOTA. 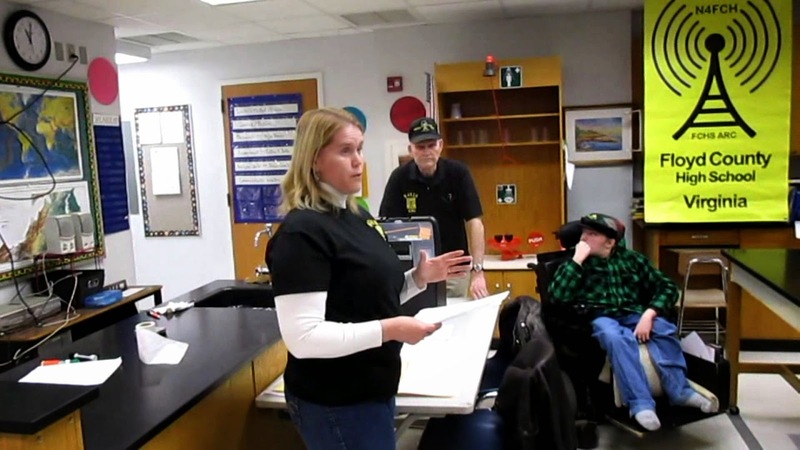 FAIRS assisting the Floyd Amateur Radio Society with the club station at the Floyd County High School N4FCH. Dee Wallace KG4VMI (FAIRS teaching some radio skills- center is Tom King W4VZH (W4FCV club) directing the club day at the High School. Chris Walters on the right is one of the club members. The Floyd County Amateur Radio Society members have installed a very nice hf UHF & Vhf station at the school. The antennas are on the roof of the school and it is a nice location to operate from with good signals. FAIRS operates from the Caribbean Island of Dominica as J79USA. Various grants of funds and equipment have been made to the amateur operators of Dominica during the past 18 years. Here is a fish of gratitude for donating a computer to a fishing village project. We ate the fish and it was very good with the Caribbean spices. Yum Yum. 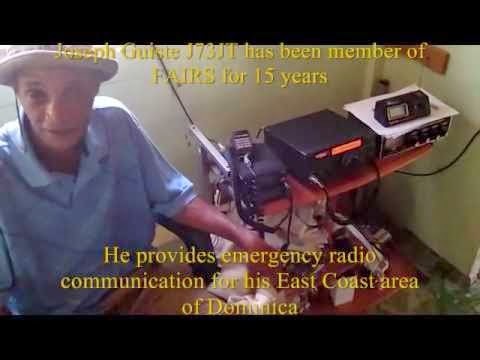 This is J73JT Joseph on the East Coast of Dominica (Castle Bruce) one many hams FAIRS assisted with equipment to enable the Island to have backup Emergency Radio Communication. Here is newest J73JT Video 2/20/15 "CLICK"
The FAIRS banner with logo. We use this at many functions and Ham Radio Fests -- FAIRS has had a commercial booth at the Dayton Hamvention for more than 25 years, When you visit the Hamvention come by and say HI - we are usually at space 412 near ARRL. Update October 8, 2015 - FAIRS one of our entities listed below has been active in helping the people in Dominica with funds and supplies to recover from the September 4th storm Erika (See Story here). More than 30 lives were lost and 600 homes destroyed and the cost to recover is estimated at 1/2 the annual GDP. Any assistance readers would like to donate for this recovery effort will be appreciated. Here is link for secure donation Pay Pal . Thank you, David Larsen, FAIRS Director & Computer museum curator. FAIRS is an Amateur RadiolMembership group and we would like to have you and other hams that like and believe in the work of FAIRS to be members. You can sign up on this page at the FAIRS website. Join N4USA every Sunday, Tuseday & Thursdays on 14,318.5Mhz at 1200z for radio schedule with our Caribbean and South American Ham friends.